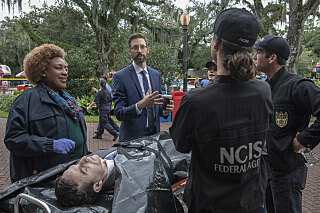 NCIS: New Orleans 5.03 - "Diplomatic Immunity"
there is still hope that the show is getting better again. Thanks for the thread. SHould be interesting to see how things will be now. pride helped with the cas- of course - but i expected that and it was okay, because he wasn't the one who find everything out and did everything he really just helped. it was more about sebastian this time. i think he did a good job, especially at the embassy. interesting to know that he bought a house. don't think pride is going to be happy with his new job, so if there is nothing in scott bakula's life going on i think he will be back with his team soon. he wasn't the one who find everything out and did everything he really just helped. Why do I get the feeling Pride's been put in a sink or swim situation? Its his first day - how about give him a chance to get to know the new job before throwing him in the deep end?